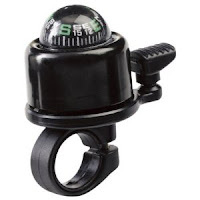 I purchased a new bicycle navigation device over the weekend. It requires no batteries, GPS signal, or 3G contract and it is perfectly legible at any angle, even in direct sunlight. If it’s dropped, broken or stolen it can be replaced for 105 yen. In addition to the navigation functionality is also has a built in, thumb activated, collision warning system. It's also tacky, barely accurate, and kind of embarrassing, but I love it and you should too. Awesome. They sell these at the hyaku-en stores? Yes, indeed I purchased this at our local ¥100 store. Our local is quite small so I expect they're not hard to find.